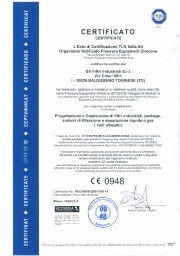 Industrial Filters GV is a company that designs and manufactures industrial filters for over 30 years. There are four main areas in which we operate: Oil & Gas, chemical and petrochemical industries, water treatment, power generation, food and pharmaceutical industries. Our added value is to follow the order of the customer throughout his career: from design to implementation. This enables speed, precision and excellent value for money. This kind of organization, in addition to continuing training which we consider essential, has enabled us to develop a high know-how in the field, allowing us to offer precise and targeted solutions. Jn industrial filters in addition to offering its customers a complete range of filtration systems and provides multidisciplinary technical consultancy. 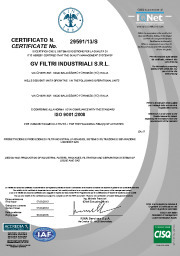 Industrial Filters GV is a company that designs and manufactures industrial filters for over 30 years. There are four main areas in which we operate: Oil & Gas, chemical and petrochemical industries, water treatment, power generation, food and pharmaceutical industries. Our added value is to follow the order of the customer throughout his career: from design to implementation. This enables speed, precision and excellent value for money. This kind of organization, in addition to continuing training which we consider essential, has enabled us to develop a high know-how in the field, allowing us to offer precise and targeted solutions. Jn industrial filters in addition to offering its customers a complete range of filtration systems and provides multidisciplinary technical consultancy. Промышленные фильтры GV является компания, которая проектирует и производит промышленные фильтры на протяжении более 30 лет. Существуют четыре основные области, в которых мы работаем: нефть и газ, химической и нефтехимической промышленности, очистки воды, электроэнергии, пищевой и фармацевтической промышленности. Наша добавленная стоимость является следовать порядку клиента на протяжении всей своей карьеры: от проектирования до реализации. Это позволяет скорость, точность и отличное соотношение цены и качества. Такого рода организации, в дополнение к продолжению обучения, которые мы считаем необходимым, позволило нам развивать высокие ноу-хау в этой области, что позволяет нам предлагать точные и целенаправленные решения. JN промышленные фильтры в дополнение к предлагая своим клиентам полный спектр систем фильтрации и обеспечивает многодисциплинарные технические консультации. GV Filtri industriali è un’ azienda che progetta e costruisce filtri industriali da oltre 30 anni. Quattro sono i settori principali in cui operiamo: Oil&Gas, chimico e petrolchimico, trattamento acque, power generation, alimentare e farmaceutico. Il nostro valore aggiunto è proprio quello di seguire la commessa del cliente in tutto il suo percorso: dalla progettazione alla messa in opera. Ciò consente rapidità, precisione e un ottimo rapporto qualità-prezzo. Questa tipo di organizzazione, oltre alla formazione continua che riteniamo elemento essenziale, ci ha consentito di maturare un elevato know-how nel settore, permettendoci di offrire soluzioni sempre precise e mirate. Gv Filtri industriali oltre a offrire ai propri clienti una gamma completa di sistemi e prodotti per la filtrazione fornisce consulenza tecnica multidisciplinare.